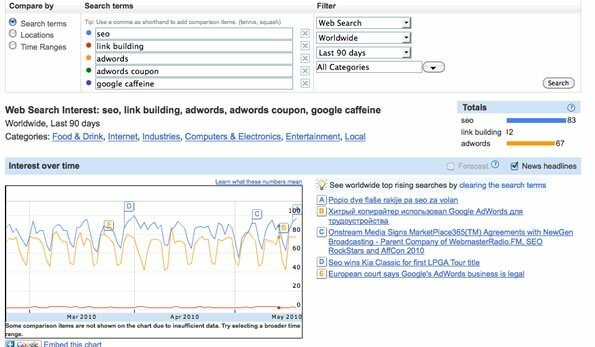 Wordtracker continues to add value beyond their position as a well-respected keyword research tool provider. Wordtracker's keyword toolset has long been popular for finding additional, longer tail keywords to apply to your search or PPC campaigns. Strategizer integrates with Google Analytics to incorporate your current keywords into the Strategizer tool to help you analyze groups of related keywords to determine how viable those groups are to your campaign. In Wordtracker's opinion focusing on a single keyword might be a losing effort for this marketer because the entire donut niche produces about 450,000 searches a month (chocolate donuts, glazed donuts, chocolate glazed donuts, and so on) and it will likely take him years to rank for that single keyword. 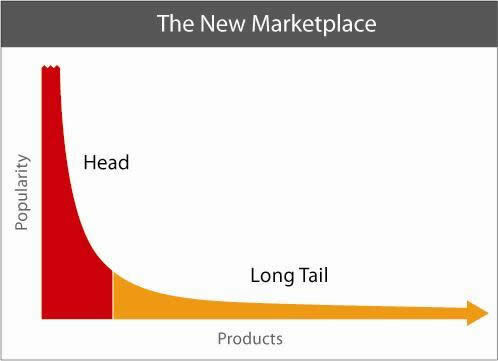 So the focus with this tool is more on the long tail side of things. In theory this makes sense but in some markets you can compete with less difficulty if you own the exact match domain and can scale the marketing, content, and link building with degrees of success. There are other ways to compete as well so while there is great wisdom in paying attention to the long tail of a main keyword there are some other factors to consider as well. The most actionable keyword research data you can get generally comes from your analytics program. So a tool which can integrate with your current analytics program and expand on your profitable (or help you find more profitable) keywords is a definite win. While there can be some concern about using Google Analytics on your site (giving Google your data and such) it's hard to argue how deep and powerful their analytics program is. 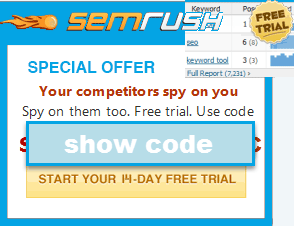 A lot of spy tools provide "keyword value" estimates based on traffic and cost-per-click figures. While that is a good barometer of how valuable a keyword might be in the eyes of a search engine, keyword data specific to your site (which factors in real traffic numbers as well as conversions) is the best way to analyze your current site architecture for expansion or improvement. A tool like Strategizer can be quite helpful in interpreting that data and providing additional keyword options based on the keywords found in your Google Analytics program. Furthermore, mining additional keywords which are found in niches that are already converting for you (with help from Wordtracker) is really quite a win because it's real data that is almost instantly actionable. You need to integrate your Google Analytics account with Strategizer for the tool to work. Once you do, you'll be given report options. Note that Wordtracker recommends having more than 20,000 non-paid search engine visits prior to processing that data (this can be a cumulative number met over months of data). In order for their niche set up and model to function correctly you do need a decent amount of data as the model is trend-based from a higher-level overview rather than a focus on individual keywords. As the third option is not yet available and there are not a ton of custom segments set up here we'll go with "Default"/"All Visits". 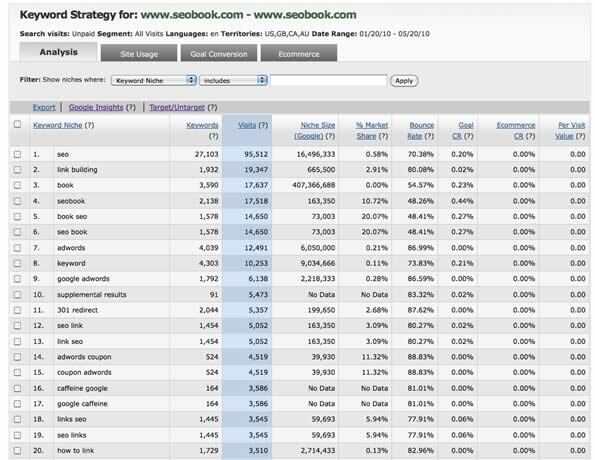 The data presented is pulled from your Google Analytics keyword report and grouped into niches by the Strategizer tool. Each keyword listed in the row is the perceived main keyword for the keyword niche and the keywords that fall under a niche classification include that main keyword as part of their phrase. So what Strategizer does is take your exact match keywords from your Google Analytics account (the actual keyword used to produce a visitor) and convert them into broader reports (niches) for all keywords containing that exact keyword found in your analytics account. Before getting into how the data is presented, understanding how niches work in Strategizer is pretty important as it is the basis of the analysis going on within the tool. 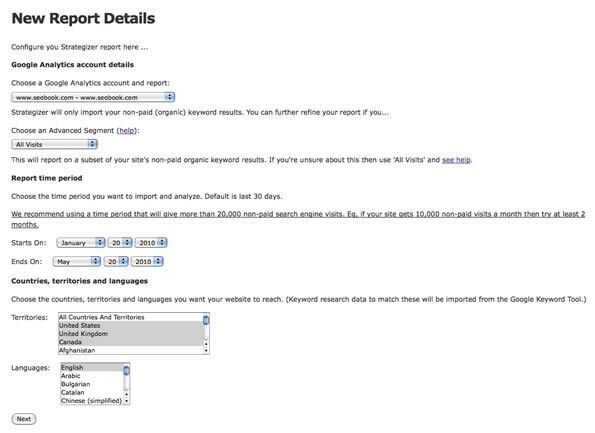 The reports will not break niches down by individual keywords so having a firm grasp of how a niche is defined will help you understand and more efficiently use the tool. *Note, a niche's name (link building in this case) is derived from an exact match keyword on your site. So in this case someone searched for link building and clicked on SeoBook.Com in the search results. Strategizer sees the keywords that are bringing you traffic and uses that exact keyword, link building in our example, to set up a niche. Then, Strategizer pulls in broad match keywords for that keyword which brought you a visitor per Google Analytics (link building in this case) via the AdWords Keyword tool to populate the "Niche Size (Google)" Column. 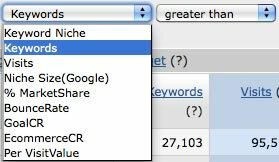 Keyword Niche - the niche defined by Strategizer via an exact match keyword in your Google Analytics program. Keywords - the number of keywords with the Niche Size (Google) data point that actually brought traffic to your site. So out of 665,000 searches done on broad matched variations of the keyword link building, we received at least 1 visit from 1,932 keywords. Visits - total number of visits from those 1,932 keywords. Niche Size (Google) - total number of searches, broad match based on the keyword that defines the niche (link building in this case) via the Google AdWords Keyword Tool. % Market Share - the percentage of searchers that end up as visitors on your site, compared to the total number of searchers out there for that niche (Visits/Niche Size). The tool also offers handy, robust exporting and filtering features. You have the following filter options (all are "greater than or less than" except for "Keyword Niche". In "Keyword Niche" you can choose to include, exclude certain keywords or just work with the one's you've targeted by checking them off). Pages/Visit - average number of pages viewed during a visit to your site. Repeated views of a single page are counted. The Goal Conversion tab will show you the percentage of visits within your keyword niches which resulted in goals that you defined in your Google Analytics account. The E-commerce tab does about exactly what you think it will do, gives you data specific to any e-commerce items you are tracking within your Google Analytics account. There are a couple of new data points here as well. (Note that our Google Analytics account didn't have this enabled, but if we would have this is one of the areas where Strategizer really sings in terms of trying to show you how much money is on the table in different keyword themes). You may only want to investigate certain keywords niches at any given point so Strategizer gives you the option to target specific niches and makes it quite easy to remove targeting and re-apply it. The sorting and filtering options are quite deep which is much needed given the vast amount of data you are given to work with. As you can see there are lots of data points to play with inside of Strategizer. Since the data is pulling right from your Google Analytics account you know that the conversion data and value data are both fairly accurate. The sorting options can help you get a good look at keyword sets which need further investigating as to why they may or may not be performing as well as other keyword sets across all the metrics in the Strategizer tool. Due to the tremendous amount of data available it makes sense to utilize the sorting options within the Strategizer toolset to help weed out keyword niches which are really low volume sets and could distort results. With great data comes great responsibility so it would be wise to play around with the filtering options within the tool to sort through results or metrics which might not be overly important to you. Right now you can't drill down into specific keywords but that is a function Wordtracker is considering. Is Strategizer Right for You? And any site owner who wants to understand as much as they can about their site, their site's engagement, and to identify areas for increased (or decreased) attention. That's a fair revue. I agree with the 'who is it for' summary. * Google Insights reports on the page beneath your own trend graphs. * Niches broken down by individual keywords (everyone wants this one). * Comparison graphs for top 10 selected niches. Really slick tool, love the interface.